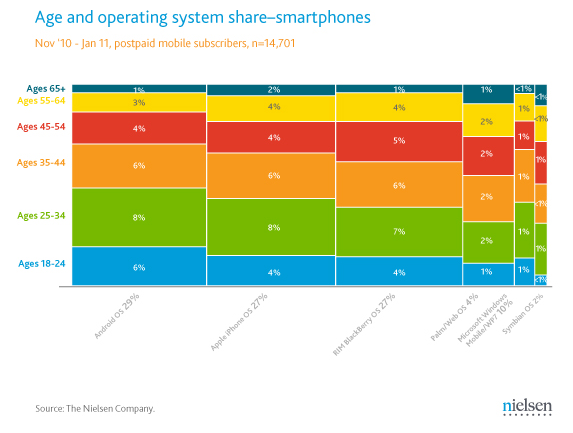 At this point, it’s no secret or surprise that Android is coming out on top of everyone’s smartphone OS studies, but in Neilsen’s latest, we get to see some interesting stats surrounding the age of those helping to make it the best. Everyone look around the bus and toss a little nod towards that young chap sitting next to you, because according to percentages, he is more likely to have an Android phone than anything else. The youth of the nation (apologies for the semi-P.O.D. reference) are usually some of the first to pick up new and interesting pieces of technology, so to see the numbers leaning Android’s way is a pretty good sign. Now, the real story is whether or not those numbers continue to climb throughout the next year, but who’s thinking they won’t? And in related news, the same study produced the chart below which presents smartphone manufacturer percentages in a very color manner. 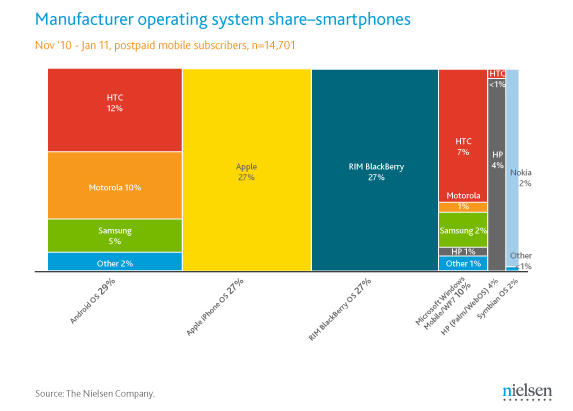 HTC is somewhat-surprisingly topping the Android charts with Motorola hugging its heals. Funny thing here, is that Samsung spent the last 6 months bragging about their sales numbers yet they are a ridiculously distant 3rd.